Ice on an air conditioner might sound like a sign that it's working really well, but this couldn't be further from the truth. Icing can lead an air conditioner to stop working and could cause serious damage if the problem isn't corrected. Take immediate action if you see or suspect icing. When an air conditioner is running, but the air flow is suddenly weak or no air is coming out, AC icing is the likely cause. If this happens, turn the air conditioning off, then check the evaporator coils for ice. The evaporator coils are usually located directly behind your air filter, and you can check them by removing the air filter and shining a flashlight inside. If your air filter is in an intake vent instead of in the AC unit itself, you may need to open an access door on the interior AC unit instead. Don't worry if you don't know exactly what you're looking for, if you have ice, it will be very obvious. The most common causes of ice are a dirty air filter that slowed the AC's air flow, running the AC with a window open, or running the AC with outside temperatures below 60 degrees. If you correct these conditions, it's safe to turn the AC back on as soon as the ice is gone. You can either wait for the ice to melt, gently scrape it off, or remove it with a wet vacuum. If your AC keeps icing up after you've tried the basic troubleshooting steps, it could be a sign of a more serious problem such as an incorrect refrigerant charge, a burned out blower fan, or problems with your ducts. At this point, leave your AC off until a repair technician can look at it. 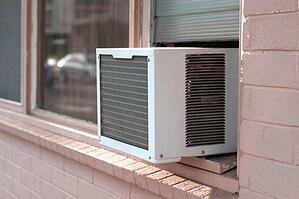 Trying to run the AC with ice on it can cause serious damage to the compressor or blower motor.